I want to push a technique that I used many years ago. It has been taught to thousands of officers at various Navy schools, but not to the QMs that really need it, and would make good use of it. I developed the technique because as a QM2, I had the plot on a Liberty Hull with a very bad gyro. This technique is a quick way to assess gyro error on the fly. It relies on the fact that the greater the distance to a navaid, the further the LOP will plot away from actual ship's position. Conversely, for close navaids, a small error will not greatly affect the accuracy of the fix. A round of bearings are taken on three charted navaids consisting of two close navaids, and one far. The two close bearings with well-spread LOP intersection is the fix. The far navaid is not part of the fix, but is called the indicator. It indicates the fix accuracy and gyro error. If the indicator passes through the fix, the gyro is true and the gyro error is zero. If the indicator misses the fix forming a triangle, the gyro has error and a correction is indicated. Place yourself at the fix looking at the far navaid. If the indicator passes to your left hand, the error is WEST and to correct you subtract error. If the indicator passes to the right hand, the error is EAST and to correct you add. See the figure to the right. Mnemonic: the word READ = Right East ADd). From now on you can tell east or west error at a glance, no guessing. 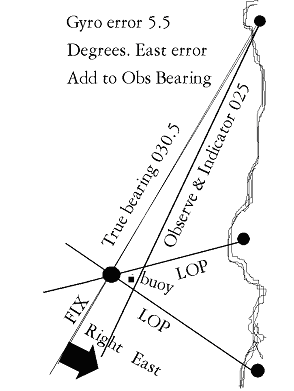 The amount of error is the difference between the observed bearing to the far navaid (the indicator) and the true charted bearing from the ship to the far navaid. The correction, WEST (-) or EAST (+) and the amount in degrees are now known, and can be added to the observed bearing and plotted for a closed or no triangle fix. The drafting machine can be adjusted by applying the error. Log the error and watch the indicator for possible changes. The maneuvering board and parallel ruler can give practice and experience by setting up many different problems that will prove the reliability of this technique, while you gain experience and confidence, and observe how the LOP of navaids at various distance and angles work in relation to one another. You can use some navaids of your home port or scheduled deployment. Place the ship in the center of the maneuvering board. Place three navaids at various distances and on various bearing lines. Write down the true bearing of each navaid. Add or subtract some error to put the same amount of error to each true bearing; call them observed bearings. Plot the observed bearing on the maneuver board. See how the observed LOPs form a triangle near the ship (center). Use the Franklin Technique to find the fix. Find the compass error correction, West or East, and the amount. The correction should be equal to the amount you used in 4, but the opposite sign. Apply the correction and re-plot. Observe: the plot in regards to the actual ship's position: the observed plot and the corrected plot. Observe that most of the time the ship is not in the triangle. Do a great number of this exercise to gain competence, insight and experience in piloting.